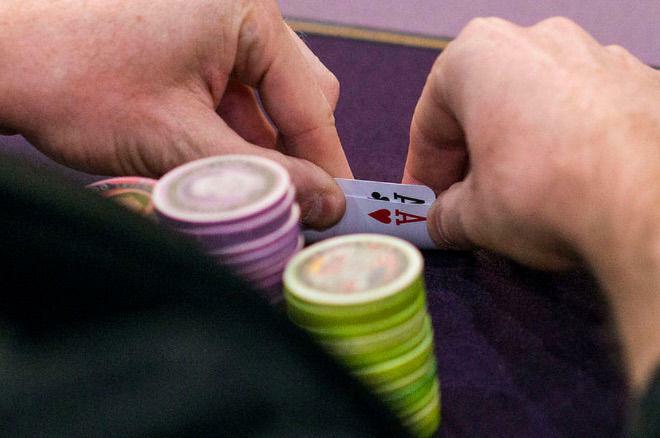 This week's tournament hand involves me getting dealt a big hand preflop, then having to decide how best to get as much in the middle as I could as long as it seemed prudent to do so. The blinds were 150/300 with a 25 ante, and after picking up under the gun I made it 800 to go from my relatively deep starting stack of about 55,000. It folded around to the small blind who three-bet big to 3,200 with what appeared likely to be a somewhat narrow range of strong hands. I had him well covered as he began with about 35,000. Given how my opponent's reraise was such a sign of strength, I definitely wanted to go ahead and four-bet and did so to 6,800. Looking back, I would have liked to have reraised even more, but that was fine and my opponent called, making the pot just over 14,000. The flop came and my opponent checked, and I definitely wanted to continuation bet. I bet 5,500 and he called, then the turn brought the and another check from my opponent. Here I bet 5,500 again, the same size bet but smaller relatively speaking (less than a fourth of the pot). I could have gone all in, but as I explain in the video below if I had shoved my opponent was only going to call off (probably) with ace-king or better. My opponent called once more, making the pot just over 36,000 and leaving himself just over 17,000 behind. The river was the , making the final board , and the small blind checked one more time. Now my choice was between going all in or checking behind, so I had to think about what hands my opponent would call with that I had beat. After getting a lot of money in on the flop and turn, I chose the cautious route on the river as the board seemed a bit too coordinated for me to continue value betting. What would you have done on the river here? Photo: "Pocket Aces" (adapted), World Poker Tour, CC BY-ND 2.0.